If you don’t want to bring traffic to your website organically, or just want to complement it, incorporate Pay-Per-Click into the marketing strategy. Aside for placing ads on various search engines, you can also do it through paid Social Media advertising with virtually limitless ability to grow. To reach large numbers of people potentially interested in what your business offers, Social Media is the perfect place to go. TheIuvo possesses the know-how – to find your perfect customer, to access them and to have them interact with your ads. A marketing budget can be only so big, but never too small if you know how to use the funds. We do. 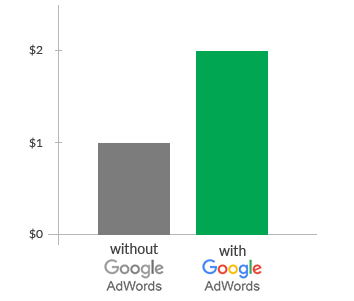 for every $1 they invest in AdWords?